In my last post, I talked about how we were being invaded by Ladybugs. Apparently, I was mistaken about their identity. 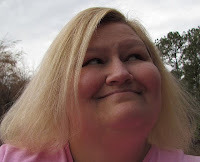 Shannon from Southern Grits and Tidbits left this comment: Actually only the red ones are ladybugs. The orange ones were brought to the US by the USDA to eat other bugs. They do bite. Wow! I had no idea. I just didn't realize there was a difference. So the picture you see above is an actual Ladybug. 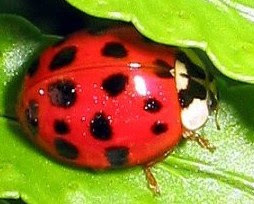 The picture below is what has invaded my home, they are called Asian Lady Beetles. They are an orange color. 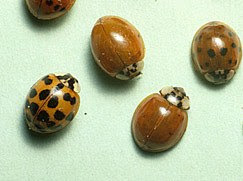 The Asian Ladybeetles were first introduced in 1916 and then twice more after that. They were brought in for different biological control programs. I am always wondering WHY they bring in things that aren't native to our country? Seriously, do we need more bugs? Fire ants were brought in from South America. I sure don't like those bugs! And Kudzu from Japan. I know, not a bug, but still not native, and it almost ate the last town I lived in. Mitchell told us last week that a ladybug had bitten him. We told him we didn't think Ladybugs bit people. But, what we didn't know at the time was that Asian Lady Beetles do! I love learning new things. Thanks Shannon for letting me know they are different from Ladybugs! That is very interesting. Thanks to you and Shannon for sharing. I didn't know that either! We have had invasions of those Asian bugs as well! I have no idea there was a difference. We get those in our house every Fall. ewwww. Okay so we had the asian ones too. Do we know why they invade the home in the way they do then? Now I'll be spooked by those bugs all the time, thankfully we are in a new state and home. Ummm... we used to gather (shovel) ladybugs for our local ag group and a few nurseries, and when they're in masses, they DO bite! Wow- learn something new every day... I didn't know that either!! I didnt know that. Thats good to know. Thanks for sharing. We get invaded by these too, though we just call them ladybugs (knowing that they're not-it's just easier to remember 'ladybug').